If you've lamented about Apple's decision to drop the MagSafe power port on its 12-inch MacBook in favor of the USB-C uniport design, you'll be happy to know that Griffin has you covered. Griffin Technology's BreakSafe is an adapter that works in a similar way to Apple's MagSafe and is compatible with any device with a USB-C (or USB Type-C) port. Unlike friction-based connectors used on rival laptops, MagSafe's claim to fame is that when someone trips over your power cable, your laptop won't come flying towards the ground. Instead, the magnetic cable detaches from your laptop to prevent serious injury to your notebook if the power cord is pulled. BreakSafe, like MagSafe, employs magnets to detach the cable if there's any tension. There are two components to the BreakSafe solution. A small 12.8mm connector attaches into the USB-C port on your notebook, tablet or smartphone, and then the rest of the power cable connects magnetically to the adapter. 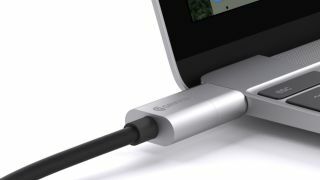 However, unlike MagSafe, which only delivers power to Apple's laptop, BreakSafe is a USB-C cable, so it should work with peripherals, storage and displays. In addition to the magnetic connection, power and data is transferred via a Pogo connection on the adapter. The cable measures 6 feet (1.8 meters) in length, and Griffin says that the adapter that plugs into the USB-C port on your device is small enough that it doesn't need to be removed when transporting your MacBook. The cable will begin shipping in April for $39 (£26, AU$54). Currently, the MacBook and Google's latest Chromebook Pixel both support the USB-C connector, but more laptops, tablets, convertibles and smartphones are expected to adopt the standard this year.